Keep your toddlers', boys and girls alike, tiny (and big!) feet cozy and dry with Forever Young's new, versatile and weather-proof rainboot! And here's the kicker for your kids' kickers - this one's lined for extra warmth: thick faux-fur lining covers the boot on the inside, while the insole is lined with soft thick cotton. Ribbed bottom provides traction on slippery ice (yes, these rainboots are warm enough to wear in winter! ), rubber exterior ensures absolute protection when prancing in puddles. 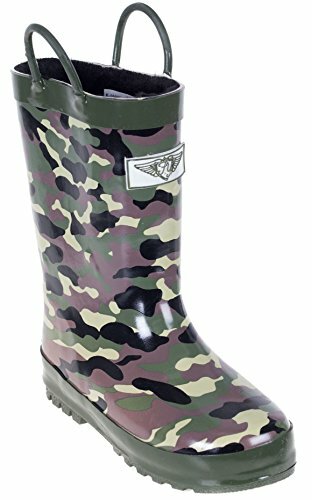 Great for walking to school on a rainy day. This boot is sure to become your child's favorite footwear! If you have any questions about this product by Forever Young, contact us by completing and submitting the form below. If you are looking for a specif part number, please include it with your message.